Finally a quilt for my oldest son, Alex. Both the other boys have one but it took me a long time to finally settle on an idea for his quilt. My mom suggested plaid since Alex seems to have an affinity for it and when I came across this, I knew it was the one. A rag quilt is created by exposing and purposely fraying the seams to give a worn, comfy look and feel. 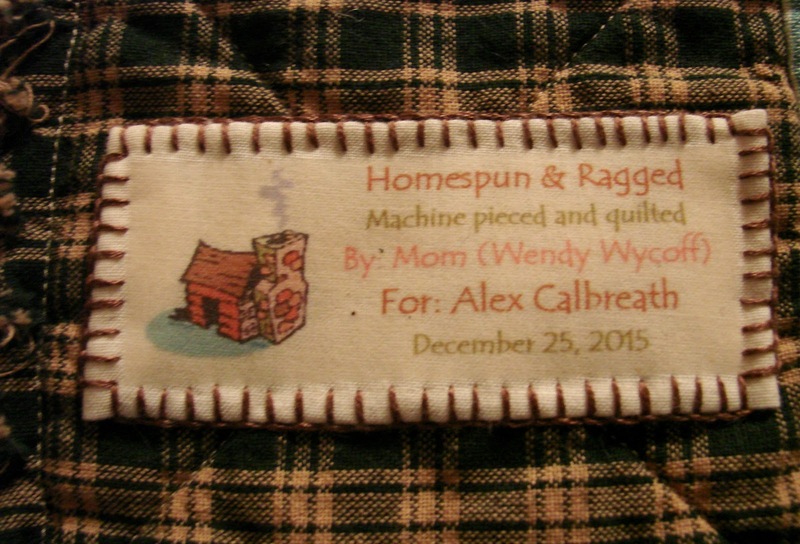 The homespun fabrics are factory recreations of fabrics originally made by spinning and dying threads (at home), then weaving them into the plaid and striped patterns as shown. The fibers are a coarse yet soft and together with the fraying makes it a cushy blanket. I love all the different colors, especially with such a nice tree as a backdrop! Hoping it brings warm and cozy nights to his home!